Your aim as a beekeeper is to get natural honey in exchange for the comfort and convenience you provide to the bees. As such, you will need certain equipment that will aid your cause. For starters, you need the beehive which will house the bees. Going further, you will need the frames onto which the bees will make their honeycomb and you will need a cover for the hive to protect the bees from the elements. Additionally, you will need equipment to protect yourself from possible bee stings and others to aid in hive maintenance activities. All these equipment and more, make up a beekeeping starter kit. In other words, they make up the arsenal of a beekeeper. These basic equipment are what you stand to get from the Dancing Bee Equipment Beekeeping Starter Kit. 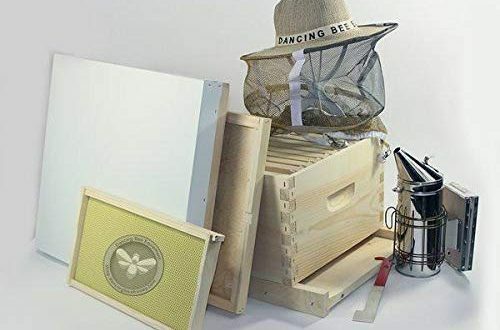 The Dancing Bee Equipment Beekeeping Starter Kit includes the very basics to get you started (except the bees of course). The items provided can be classified into three major categories. We have the category that has to do with beehive itself, and the components that make it up. Then there is protective equipment and lastly the beehive maintenance equipment. The finger jointed pine brood box, the 10 deep frames, the outer cover, the inner cover and the bottom board are all components that make up the hive. The brood box in this kit already comes assembled. The protective veil and and bee smoker both fall under the protective equipment category. Lastly, the hive tool falls under the beehive maintenance equipment category. The beehive components are what you need to build a home for the bees. The 10 deep frames included in the kit are the maximum capacity for a Langstroth hive, which means you have a maximum honey making capacity. Of course, only one brood box is included in the kit and it can carry you only so far and no more. However, the interesting thing about a Langstroth beehive is that they are expandable, which means you can place other boxes frames on top of it, thereby, expanding the bee colony. This translates into more honey making capacity. So while the kit only comes with one box, the room for expansion is there. The brood box is 7/8-inches thick, is finger jointed and made from white pine wood. The box itself is quite sturdy and is painted for added longevity. As for the other components, the bottom board is used to protect the hive from pests that may want to crawl into the hive underneath, while the inner and outer cover both work to protect the hive from the elements. The next category is the protective equipment. Remember that as much as you want to be friends with the bees, they do not care about the same. This should, however, not stop you from achieving your aim and this is why the protective beekeeping wear was designed. The Dancing Bee Equipment Beekeeping Starter Kit includes only a protective round veil. It does not include a jacket nor gloves, which I found to be very lacking. While the veil is well made and does a good job of protecting your face, the rest of your body is still very much exposed to bee stings. For the cost of this beekeeping starter kit, I do believe that Dancing Bee Equipment could have included those key items. The next important protective equipment is the bee smoker. The purpose of the smoker is calm the bees so as to prevent them from stinging you while carrying out hive maintenance activities. The bee smoker is made from stainless steel and functions as well as you would expect. Lastly, you have the beehive maintenance tools. The kit features a stainless steel j-hook hive tool which functions well for its intended tasks. More costly than similar packaged kits in the market. Does not include gloves nor a jacket. The decision to start beekeeping is like the decision to join the army. Only, in this case, you are on a peace treaty mission. Your enemy will be prepared to fight you but you can’t fight them back. Rather, you will be careful not to harm them. This is because you have something valuable you want to get from them. Therefore, you will kit up like a soldier but the weapons with you will be for friendlies. This analogy is to explain the relationship between you as a beekeeper and the bees. Your aim as a beekeeper is to relocate the bees from their home in the wild to the hive you have created for them. And in return, they are to supply you with pure and natural honey, as well as other beehive products. The relationship is supposed to be mutual in nature. However, the bees do not know this. They do not care if it is you who provided them the resident hive. They are not pets like dogs that will wag their tail at you when they see you around. The bees will rather try to defend themselves against you. It is, therefore unwise to show up at the bee’s colony without proper the proper arsenal. You may have yourself to blame for that. The Dancing Bee Equipment Beekeeping Starter Kit is geared towards beginners for beekeeping. However for the cost its going for, I do think it could have offered more. Even so, while it may not be as fully packed as other kits available on the market, but it does provide you with some key equipment needed for getting started in beekeeping.